Welcome to 10 Years On, the series where we take a look at some of Football Manager 2017’s best wonderkids and how they have developed ten years in the future. In this post we take a look at Moise Kean. Italian side Napoli bought Moise Kean from rivals Juventus for £10.75M in 2018. Dortmund signed Moise Kean from Napoli in January 2020 for £29.5M. Dortmund will be very pleased with selling Moise Kean to Monaco for a huge £57M. Kean played just 3 games for Dortmund as they made a profit of £27.5M! Moise Kean made his international debut for Italy in 2019. He went on to play in two European Championship finals but came second on both occasions. Thanks for reading our 10 Years On article for Italian wonderkid Moise Kean. If you enjoyed this post, feel free to share it via social media! You can also follow us on social media through the links above. 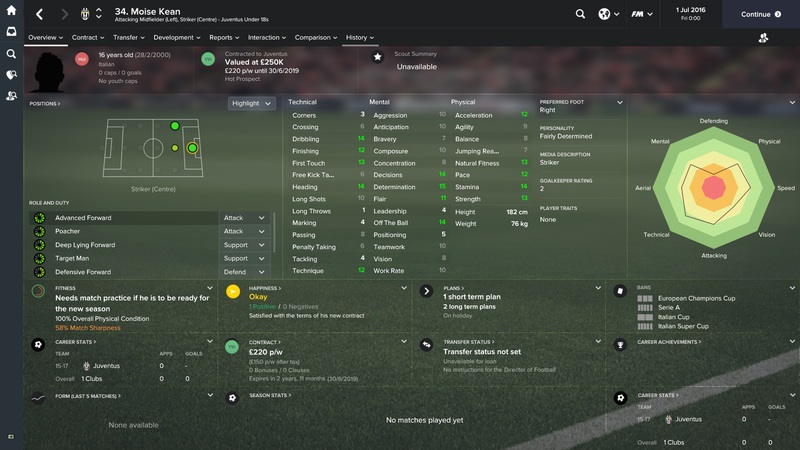 This entry was posted in FM Wonderkids: 10 Years On, FM17 Guides, Experiments & Wonderkids, Football Manager 2017 and tagged as monaco, borussia dortmund, cagliari, fm wonderkids, fm17, football manager, italy, juventus, moise kean, napoli. Bookmark the permalink.